"Deals of the Week! Save Up to 15% on Subscriptions, Plus Get Free Support and Updates." Need to backup your entire Windows Network? 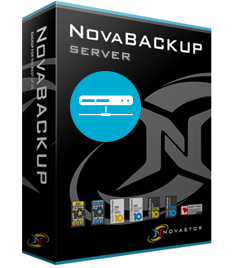 Our NovaBACKUP Network® product provides reliable, full-service Windows Server Backup Software tailored to meet the needs of small networks with central monitoring, multi-streaming technology and world-class support, starting at only $1416.10. Back up your data to external hard drives, local media devices, network attached storage, or even the cloud, or any online file sharing service. NovaBACKUP tested up to 4x faster than the nearest competitor. And, the new NovaBACKUP 19 offers up to 4x faster restores - without compromising reliability. Hard drive crashes are a fact of life. But with Disaster Recovery, you always have an image backup of your entire system, including settings and preferences. Our software engineers are constantly upgrading NovaBACKUP to speed up and improve our backup technologies, to protect against the newest virtual threats, and to streamline our user experience. All NovaBACKUP products now includes our industry-leading US-based NovaCare support. That means unlimited access to phone, email, and live chat help from our local, one-on-one support engineers, and unlimited access to a vast library of helpful guides and documentation. Our technical support team is located right here in the USA, NOT overseas call centers. Without a Dedicated IT Team, small businesses face immense pressure to generate profits while performing at maximum efficiency. Spending resources to protect data may not always be at the top of the priority list, but that doesn't mean it isn't critical to success. Give us a call, or send us an email. We're here to help.